Discussion in 'TalkCeltic News' started by Mr Shelby, Oct 25, 2017. THE Northern lights of old Aberdeen are still well and truly on the blink following tonight's entertainment at Pittodrie, as Brendan Rodgers' Celtic once again came up trumps in a big test, to move 3 points clear of their nearest rivals for the first time this season. A blistering strike from Kieran Tierney was followed by a deadly Dembele double, as the Frenchman continues his return to form after a lengthy lay-off. The win sees the Hoops consolidate their lead at the summit of the league, while further adding to their lengthy, unbeaten domestic run, which now stands at a staggering 61 games. In the run up to this evening's game, all the talk was of a tight, closely contested affair being in store, with nothing to separate the two sides at the top of the table prior to the 19:45 kick off. Aberdeen had been on an 11-game unbeaten streak prior to tonight, and if ever Celtic's run was to end, many would have looked at this game on the fixture list and highlighted it as the perfect moment. However, in truth, after the 90 minutes have been and gone, Derek McInnes' Aberdeen side can walk away from the stadium knowing they have been taught a footballing lesson by a far superior Celtic team in front of a packed Pittodrie crowd. The Dons have only a 5 minute spell at the beginning of the match to look back on as highlights, as after that short period, Rodgers and his invincible's firmly exerted their control on the game. After murmours of fatigue being shown during the weekends game against Hibs at Hampden, there was anything but on show tonight. The Celts' passing was crisp, their movement fluid, and their finishing ruthless. Brendan Rodgers' decision to move to a 3 at the back formation completely bamboozled McInnes and his coaches, as his side looked helpless and surprised at the shape of the Celtic starting XI. They clearly were not expecting the likes of Scott Sinclair and Patrick Roberts to be absent either, another sign of the strength in depth the Champions boast. They had only 13 minutes to wait for the opener, and it came from the man (or bhoy) we all love to adore, Kieran Tierney. Following an exquisite through ball flick by Tom Rogic - who was untouchable during his 72 minutes on the park - Moussa Dembele had the pace and power to beat the Aberdeen backline, and he flashed the ball across the six-yard area from the right hand side of the box, to meet the onrushing full back Tierney. The 20 year old still had so much to do from a tight angle, but like a seasoned attacker he rifled the ball high into the Aberdeen net via the crossbar, to cap off what was a superb Celtic move. From that moment onwards, things were only set to go from bad to worse for Aberdeen. The team from the granite city can without doubt rightly claim to be the second best side in Scotland. Tonight's performance from Celtic however once again re-affirmed their position as the untouchables in the Ladbrokes Premiership. Quite simply, in this sort of form, no-one in the league can come close to the Hoops. 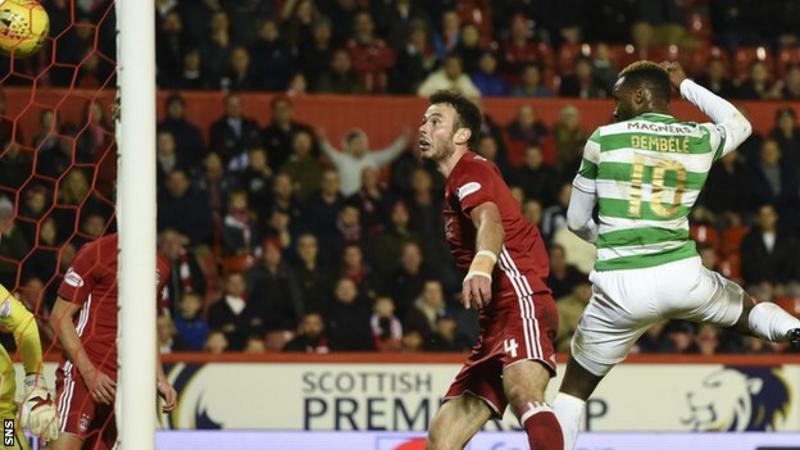 That was all too evident in this game, as the passing and movement of the Celtic players continued to cause all sorts of problems for a very slow and cumbersome looking Aberdeen backline. It seemed as though it was a case of making it to half time for McInnes, so he could then re-assess the situation. However, on the 38th minute, Moussa Dembele scored to make it 2-0 to the Celts and at the same time, ensure that it was all the more likely that they would be heading back down to Glasgow with yet another 3 points. The goal was a scorcher once again and, funnily enough, it involved the same two players at the finish, only this time the roles were slightly reversed. After Dembele had set up Tierney for the opener, the left back obviously felt obliged to do the Frenchman a turn and set him up for a goal of his own. Picking the ball up on the halfway line, Tierney charged at the Aberdeen lines, beating right back Shay Logan with an easy knock-by, giving him all the time and space needed to fire in an utterly delicious ball to the back post. You are unlikely to see a better cross anytime soon, it was pinpoint in terms of accuracy and all the striker had to do was get any form of contact on the ball. After a frustrating spell on the sidelines, last seasons 32 goal hero looks back to his powerful and clinical best, perfect timing with the big game against Bayern coming up next week. It was his 4th goal in two games, sending a firm 'I'm back' message to Leigh Griffiths, who has been looking jaded of late. It was also a sucker punch for Aberdeen, coming just before the half time whistle, with the old football cliche being that this is often the perfect time to score. Albeit, it was the very least that Celtic deserved. The second period was to continue in the same vain, with the Dons looking completely in awe of the 6-in-a-row Champions, unable to offer anything in retaliation. At this point, it was really just a question of how ruthless Celtic wanted to be. The chance to make it 3-0 was spurned after Kari Arnason cleared off the line from a Dembele shot just before the hour mark, but the Hoops were not made to rue this opportunity, as on 63 minutes, the Frenchman claimed another brace. This goal was all about him. After being completely clattered by Aberdeen centre back McKenna on the near touchline, a challenge which, on another day might have been a red, Dembele made his way into the box to collect an easy tap in following a Dedryck Boyata knock down. The game and 'contest' on the whole was now well and truly over. The Dons fans were even beginning to make their way to the turnstiles and the silence was eerie considering it was a sell out. With the game wrapped up, the Hoops took the foot off the gas slightly (not that they were overly exterted in the first place). Rogic, Dembele and Forrest all made way for Sinclair, Griffiths and Hayes respectively later in the second half, with the latter former Aberdeen man unlucky not to get contact on a terrific Leigh Griffiths cross towards the final whistle. It would have been the perfect return to his old stomping ground, but for a crucial Andy Considine interception. As previously mentioned, prior to kick off this evening I'm sure some Celtic fans wouldn't mind admitting that this had the potential to be a pretty tough game. I know that I was certainly expecting a lot more from an in form Aberdeen side. The reality however was the polar opposite. The men in green and white were simply imperious from start to finish and it was clear that Rodgers had instructed them to go out and prove a point to the team who are seen as their only real 'challengers' in Scotland. After a hectic 10 days or so, every one of the players deserve enormous credit to have gone out and put on a performance such as the one we witnessed this evening. Needless to say, the manager himself must be given plaudits for showing his tactical flexibility once again, a skill that very few coaches in world football can claim to have. The Prof, Bobo_, kramer1 and 2 others like this.